As a glassmaker and a magician-in-training, Opal Cowen understands trial by fire. Now it's time to test her mettle. Someone has sabotaged the Stormdancer clan's glass orbs, killing their most powerful magicians. The Stormdancers—particularly the mysterious and mercurial Kade—require Opal's unique talents to prevent it happening again. But when the mission goes awry, Opal must tap in to a new kind of magic as stunningly potent as it is frightening. And the further she delves into the intrigue behind the glass and magic, the more distorted things appear. With lives hanging in the balance—including her own—Opal must control powers she hadn't known she possessed…powers that might lead to disaster beyond anything she's ever known. Since being captivated a few months ago by Snyder's dystopian novel, Inside Out, I decided that it might be time to give her fantasy novel, Storm Glass, a chance. And I have to say that I was very pleasantly surprised. Readers of Tamora Pierce will quickly discover that they have found a kindred soul in Snyder. Her words flow effortlessly from the page creating a breath-taking world that readers will never want to leave. It is a world that is easy to bask in. The details are full bodied and utterly enchanting. This can also be said of the characters. Opal, Kade, and the many characters from Snyder's previous series, the Study series, make up one amazing group of characters. They are funny, serious, and just plain fun to read about. With this full and diverse group of characters, readers will quickly discover a favorite to root for. Storm Glass is a quick paced novel that kept me glued to its pages. And while I must admit that I have yet to read Snyder's previous Study series, I can guarantee that the world that has been introduced to me is being begged to be further explored. And these novels will be devoured as soon as I can get my hands on them. Ooooh, this sounds like such a good book! I, too, was totally captivated by Inside Out and am anxiously awaiting Outside In (which doesn’t get published until March 2011, boo) – I am definitely going to have to see if I can obtain a copy of this one to tide me over! I have read that if I liked The Hunger Games I would like this book. Its good to hear your review – I think it will be on my next TBP (to buy pile). This series looks really good and I can’t wait to start it! I never thought of comparing Snyder to Pierce but I can really see that-and I do love both! Definitely check out the Study series-Poison Study is one of my favorite books and most people I’m aware of have loved it! I agree with your comparison to Pierce and Synder. 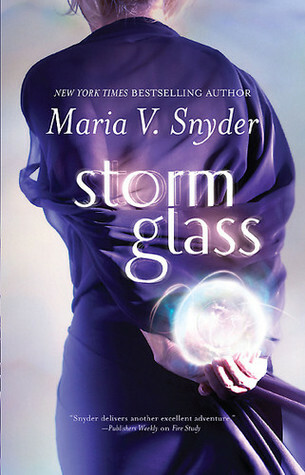 I have enjoyed both Storm Glass and Sea Glass and can[‘t wait to see what happens in Spy Glass. Lovely review. I absolute loved Pierce’s work when I was younger. I just devoured her novels as quickly as I could. And this definitely sounds like a really great series that I would undoubtedly enjoy. Thanks for the review – I probably would have never discovered these on my own! Storm Glass is going to be a great book. Great review. I saw this cover at Borders and it’s so pretty! It also sounds really interesting. Thanks for the review!